The WOMEN’S XC LITE series was born from rider feedback and an integration of the latest fabric technologies. Engineered to provide the highest level of durability while maintaining an extreme level of mobility and ventilation, the WOMEN’S XC LITE series is the perfect choice for the fastest off-road racers. HEAD: Measure circumference of head just above top of ears, and 1 inch (2.54 cm) above eyebrows. SLEEVE: With your arm fully extended, measure from the center back of neck at spine to the wrist bone. HIP & SEAT: Place the measuring tape around the body at the fullst part of the lower hip, feet together. INSEAM: Without shoes; measure on inside of leg from groin to the floor. 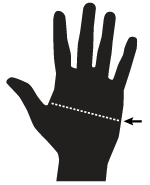 HAND: Measure circumference around your dominate palm at the widest point.